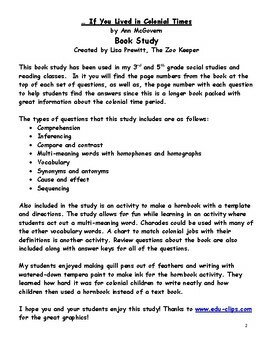 This book study has been used in my 3rd and 5th grade social studies and reading classes. 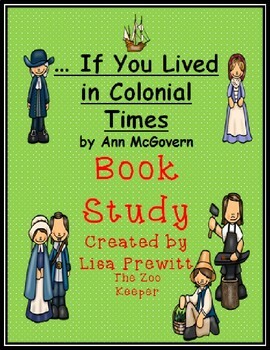 In it you will find the page numbers from the book at the top of each set of questions, as well as, the page number with each question to help students find the answers since this is a longer book packed with great information about the colonial time period. 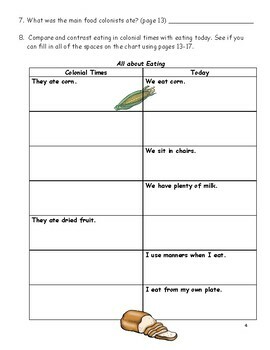 Included in the study is an activity to make a hornbook with a template and directions. There is a pattern to make a quill pen to write on the hornbook. The study allows for fun while learning in an activity where students act out a multi-meaning word. Charades could be used with many of the other vocabulary words. A chart to match colonial jobs with their definitions is one of the activities. I have included a crossword puzzle with and without a word bank. Review questions about the book are also included along with answer keys for all of the questions. My students enjoyed making quill pens out of feathers and writing on their hornbooks. They learned how hard it was for colonial children to write neatly and how children then used a hornbook instead of a text book. This study is packed with lots of information including reading skills and social studies cross-curriculum activities.